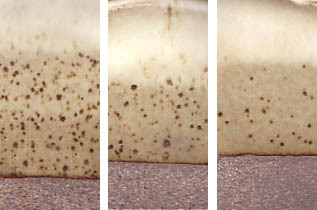 This glaze can be used to create classic matte oatmeal effects at cone 10 reduction. The shade of color varies with thickness, especially on high iron bodies where thinner sections are darker. Many of glazes of this type have micro-dimples in the surface and cutlery marking problems, likely from too much lithia (from spodumene), however this one has been reliable for us. L3362A speckle test cone 10R (G2240 spodumene) using ground iron stone concretions (50% 70-100 mesh, 35% 50-70 mesh, 15% 40-50 mesh) at 0.5%, 0.3%, 0.1% (left to right).